When the Ladymatic first appeared in 1955, it became a defining timepiece in women's fashion. Six decades on, it still retains every ounce of captivating style and grace. In this model, 18K yellow gold has been used to create both the 34 mm case and the waved links of the white leather strap. This stunning material also features on the polished alpha-shaped hands, as well as 11 indexes, which are set with diamonds. The attractive dial is made with white, mother-of-pearl, to accentuate the feminine touch. 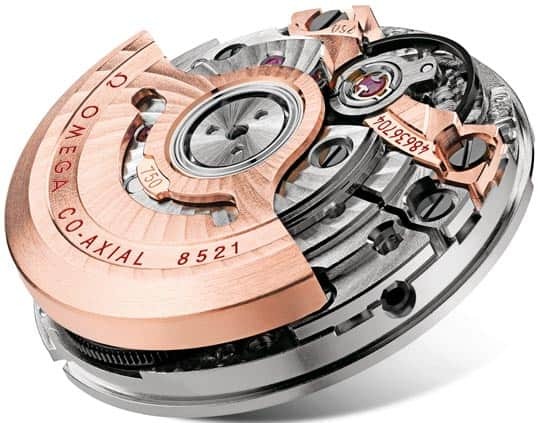 Days are tracked by a date window at 3 o'clock, while the titanium inner body includes the OMEGA Co-Axial calibre 8521. Self-winding movement with Co-Axial escapement. Free sprung-balance system with silicon balance-spring. Automatic winding in both directions. Oscillating mass and balance bridge in 18 Ct red gold. Luxury finish with exclusive Geneva waves in arabesque.